Ever since the number of troops in Iraq began to be scaled back, the focus on the military front in the United States switched over to the conflict in Afghanistan. Many people who are not in tune with the process of American warfare and how foreign affairs work do not realize that a full and immediate withdrawal of troops from Iraq and Afghanistan is not realistic. But a slow and thought out strategy that would over the course of a few years remove American troops from the battlefields of the Middle East and leave the nations of the Middle East in good hands is realistic. And that is exactly what President Barack Obama has been doing since he first stepped foot into office over two years ago. The process is well under way in Iraq. And now, reports coming out of Washington indicate that on Wednesday President Obama will announce that the withdrawal of American soldiers is going to begin in Afghanistan. Around one hundred thousand troops are currently serving within the borders of Afghanistan. Obama said that a “significant” amount of troops are going to begin coming back to the United States as soon as July. The overall goal set out by President Obama is to remove most of the troops in Afghanistan while leaving the Afghani government, military, and police forces prepared to control the Middle Eastern state without any needed help from the United States military officials. 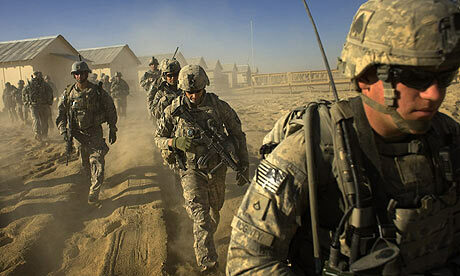 In December of 2009, Obama increased the number of troops in Afghanistan by about thirty thousand. The decision was part of an elaborate plan to restore proper authority in Afghanistan and rid the government of terrorists. The final goal is to “transfer full security lead over to the ANSF in 2014,” according to Jay Carney. Is this a sign that the American presence in the Middle East is going to minimize in the next three years? Is it a sign that the American government is going to move focus to the next state that is dominated by a terrorist regime? Or is it a sign that the American government is adamant about refocusing resources on domestic needs? Only time will tell.